We offer many opportunities and services to guide and support you on your successful journey with the UVa School of Medicine. 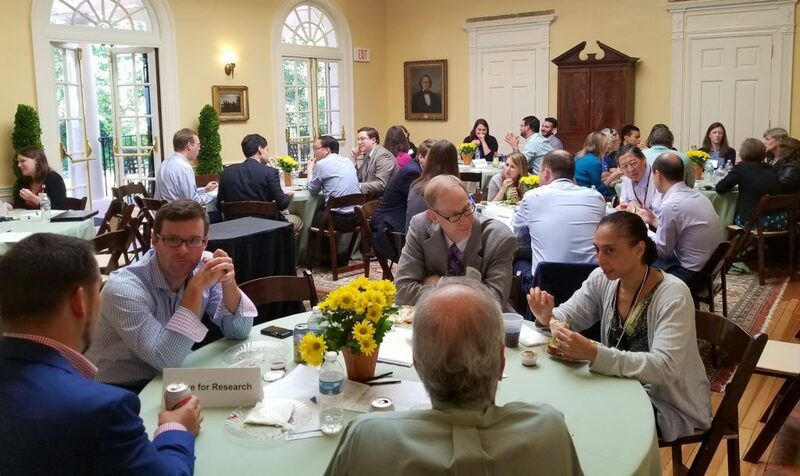 During your first year, we invite all new faculty to attend our half-day New Faculty Retreat, as well as other faculty development program sessions which are of interest to you. Opening and introductions: department chairs introduce their new faculty, over breakfast. Opportunities for collaboration: attendees work in small groups to identify areas of potential collaboration in research, medical education, and patient care. Academic advancement and transition: attendees have an opportunity to meet with (and get tips/insights from) newly promoted faculty in their track. Introduction and lunch with key SOM faculty support: invited leaders will briefly describe the resources/services they offer. (To be followed by a luncheon with these leaders to allow individual or small-group consultation.) Representatives will present on services provided by the Claude Moore Health Sciences Library, the Promotions and Tenure Committee, the Mindfulness Center, the Faculty and Employee Assistance Program, the Office for Research, the Office of Grants and Contracts, the Academy of Distinguished Educators, the Medical Alumni Association & Medical School Foundation, and the Office of Marketing and Communications. This retreat is moderated and organized by Susan M. Pollart, MD, MS, Senior Associate Dean for Faculty Affairs and Faculty Development.